MAN 70 YO EPIGASTRIC PAIN FOR ONE MONTH. 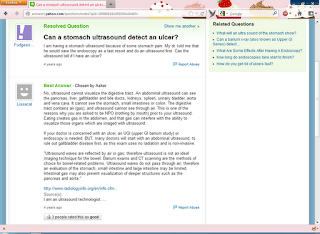 FIST STEP IS ABDOMINAL ULTRASOUND FOR CHECKING LIVER, GALL BLADDER WHICH WERE NORMAL. THEN ONE AIR SPOT WAS DETECTED IN THE WALL OF ANTRUM. THE AIR SPOT WAS STILL AT THIS SITE AFTER CHANGING POSITION; ARROUND THIS AREA THERE WERE NOT INFILTRATION OR FLUID COLLECTION. Gastroscopy detected crater ulcer at antrum. Biopsy was done with predictive benign ulcer. Biopsy report was chronic ulcer with HP positive. 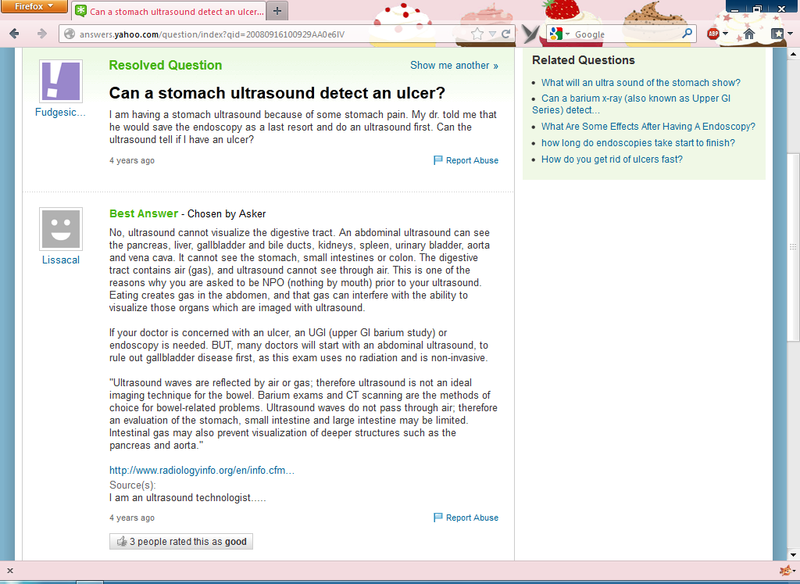 Until now ultrasound is not useful for diagnosing gastric ulcer (see reference).